Our cutting department is equipped with Gerber computerized cutting machines. We also cut with hand cutting machines for sample or custom orders. Using a base pattern we will use the Gerber Accumark marking and grading system to grade patterns and create markers. We can also import complete markers electronically to cut to any customer specifications. 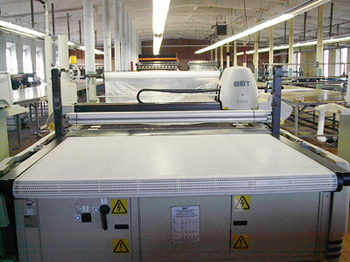 We have the capability to cut a variety of fabrics including knits, wovens, outerwear, fleece, and bedding fabrics. 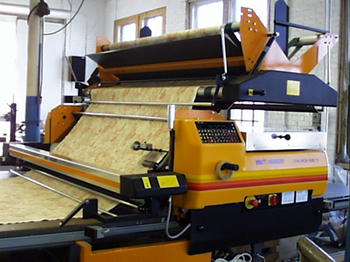 We use state of the art Niebuhr cradle feed spreading machines which allow us to spread fine fabrics without stretching. Our spreading equipment also maintains a straight edge on the stacked fabric which maximizes the fabric yield. We are experienced with contract cutting for domestic manufacturers. We are equipped to cut and ship to any facility. Our company has the capability to receive piece goods, warehouse, provide inventory control, and ship your goods to any location. Our pricing is competitive and our turn time is quick.